T.D. Jakes, megachurch pastor, bestselling author and film producer, is teaming up with Oprah Winfrey for another "Lifeclass" event this week to help viewers get over whatever past hurts or tragedies might be holding them back, and inspire them to embrace a "new way of thinking." "Are you your own worst enemy? Are negative thoughts and self-doubt holding you back from living your best life? Have you had major setbacks in your personal or professional life that have shaken your confidence?" are some of the myriad questions posed to potential participants in the April 30 "Oprah's Lifeclass." A form seeking participants on Oprah.com insists, "Oprah and Bishop T.D. Jakes are ready to help you live the life you've always wanted on an upcoming #Lifeclass." The "Oprah's Lifeclass" event, not the first appearance for Bishop Jakes, will allow online viewers to participate by logging on when the program goes live in Chicago on Wednesday at noon ET. 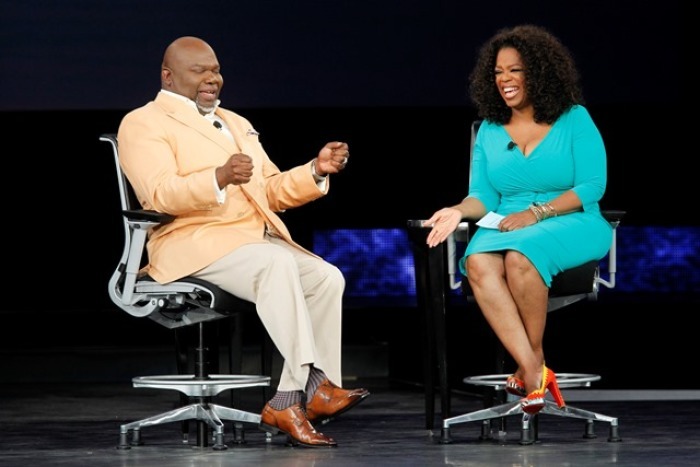 Previous discussions during Jakes' appearances on "Oprah's Lifeclass," and a similar event held at his 2013 MegaFest, centered on purpose, family issues and fatherlessness. The "Oprah's Lifeclass" event, which is being filmed this week and airing on OWN on May 4, appears to fall along lines similar to the message delivered by Jakes during a "LifeClass" at MegaFest, when he touched on the consequences of people holding on to their past. The Dallas megachurch pastor tackles similar issues, and more with his BET talk show, "T.D. Jakes Presents: Mind, Body and Soul," where he doles out expert advice on health, finance and more and interviews celebrity guests. Jakes is the founding pastor of the 30,000-member The Potter's House in Dallas, Texas.